All transactions are safe and secure with a reliable history in online purchasing behind each of our associates. Buy the Spider-Man Chest Tear t-shirt to own Spider-Man clothing and merchandise. This piece of Spider-Man clothing displays a chest tear that reveals the costume of Marvel's most famous superhero. 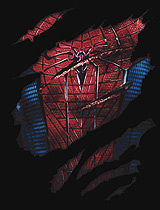 Perhaps the damage done to this Amazing Spider-Man t-shirt happened during one of his battles with the Green Goblin or The Lizard. Yet again, maybe he was doing some mud wrestling with the Amazing Spider-Pig character from The Simpsons Movie. Whatever the case, this piece of Spider-Man clothing is the perfect way to subtly reveal your inner web slinging superhero. In addition to the Spider-Man Chest Tear tee above, browse the Spider-Man Clothing Gallery for more apparel like men's and women's clothes, kids shirts or hoodies.